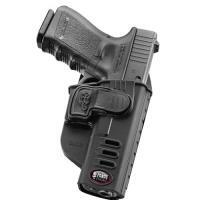 Keep sidearms securely at the hip with the Fobus CH Rapid Release System Belt Holster. The unique locking system upgrades this holster to a level II retention holster for maximum safety. Engineered for a seamless quick draw, this pistol holder has been constructed with a finger activated releasing paddle that does not hinder shooter's natural draw stroke. Expertly placed, the release mechanism is located on the holster along the frame in natural alignment with the index finger, creating a smooth and fluid draw action. Known for their dedication to excellence and quality accessories, Fobus is the only stop necessary for any gun enthusiast.